Transitional Data Services (TDS), a leading provider of services and software to manage the end-to-end process for data center and IT transformations, announced today that 451 Research published a report on December 22, 2015 about the company and its TransitionManager™ software application. According to the 451 Research report, “TDS Accelerates into the Cloud Migration Market,” TransitionManager stands apart by covering the end-to-end process for complex IT and data center transformation initiatives. Available both as a SaaS offering as well as on-premises software, TransitionManager helps IT organizations streamline the full process from discovery through execution. The ability to aggregate data from multiple sources, provide dependency mapping, automatically generate runbooks for data center transitions, and provide “what if” analysis for planning. To help meet demand for its data center transformation solutions, TDS recently received its first round of funds from outside investors. The funds will be used to accelerate development of TransitionManager enhancements as well as target other channel and geographic opportunities. Among the chief business benefits for IT teams that the 451 Research report points out are reduced down time, decreased impact on internal staff, shortened overall project lengths, lower costs and more predictable project planning with reduced risk. 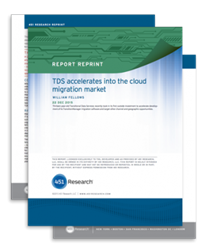 To download the report and learn more about TDS and TransitionManager, please visit TDS_Accelerates_Into_Cloud_Migration. Transitional Data Services (TDS) provides industry leading services and software to manage the end-to-end process for data center and IT transformations. This includes services for application migrations, virtual/cloud migrations, data center relocations/consolidation, network & infrastructure design and 24/7 environment monitoring and technical operations. Transitional Data Services and TransitionManager have been recognized by Gartner as a “cool vendor” in May, 2015.